Steel Forging is a drop forging process which involves the use of hammering or pressing techniques to alter the steel’s shape, maybe followed by heat treatment. This method produces in the steel a number of properties which distinguish it from other treatments of this metal, for example casting, where liquid metal is poured into a mold and then left to solidify. Stainless Steel (SS303, SS304, SS316, ect): Stainless steel forgings are composed of a ferrous alloy characterized by a “stainless” quality brought about by its protective oxide layer that helps the material resist corrosion. All stainless steel grades contain at least 10.5% chromium. 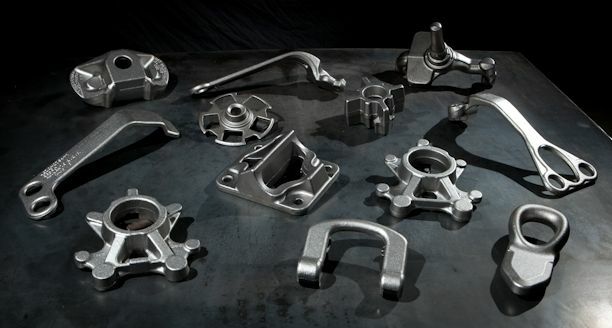 Depending on the grade selected, stainless steel forgings resist crevice corrosion, stress cracking, pitting, heat deformation, and much more. There are four main types of stainless steel – duplex, austenitic, martensitic, and ferritic. 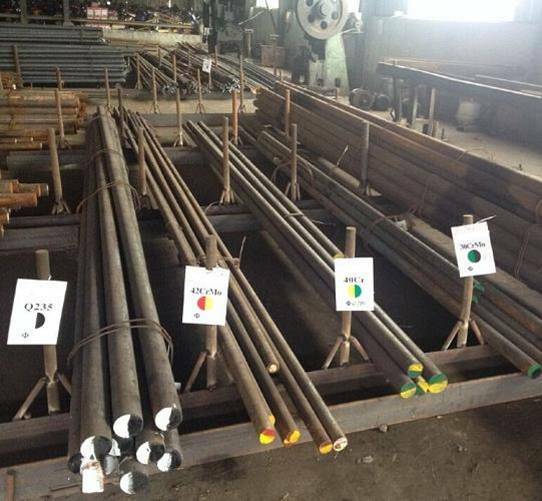 Carbon Steel (1020, 1035, 1045, A105, Q235, 20CrMnTi, ect): There are four main grades of carbon steel: low carbon steel, medium carbon steel, high carbon steel, and very high carbon steel. Depending on the amount of carbon present in the material, carbon steel forgings are hardenable by heat treatment to increase yield and impact strength as well as wear resistance. Low or mild carbon steel contains 0.05% to 0.26% carbon and encompasses grades 1018 and 1020. The lower carbon content causes the material to be more ductile and less brittle, making mild carbon steel a good choice for forging. Medium carbon steel contains 0.29% to 0.54% carbon and includes steel grades 1141. Containing a higher level of manganese, medium carbon steel can be used in the quenched or tempered form for forged crankshafts and many other types of forgings. High carbon steel and very high carbon steel exhibit hardness as well as resiliency and are brittle due to their higher carbon contents, between 0.55% and 2.1%. Alloy Steel (20Cr, 20CrMo, 30CrMo, 35CrMo, 42CrMo, ect): Alloy steels encompass a wide range of iron-based metals which contain higher levels of chromium that do not exceed 3.99%. Metals that contain greater amounts of chromium are classified either as tool steels or stainless steels. Alloy steels vary in their alloying elements which determine the properties of a particular material. Strong & Durable : Steel forgings have a generally higher strength and are typically tougher than steel processed in other fashions. The steel is less likely to shatter on contact with other objects for example, making forged steel highly suitable for items such as swords. This increased strength and durability is a result of the way in which the steel is forced into shape — by pressing or by hammering — during the forging process. The steel’s grain is stretched by this process, and ends up aligned in one direction, as opposed to being random. Following the pressing or hammering, the forging is cooled in water or oil. By the end of the process, the steel is stronger than it would have been had it been cast, for example. Anisotropic: A steel forging’s strength isn’t consistent all the way through; instead, steel forgings are anisotropic, which means when the metal is worked on and deformation occurs, the steel’s strength is greatest in the direction of the resulting grain flow. This results in steel forgings which are strongest along their longitudinal axis, while in other directions, the forging will be weaker. This differs from steel castings, which are isotropic and therefore have almost identical properties in all directions. 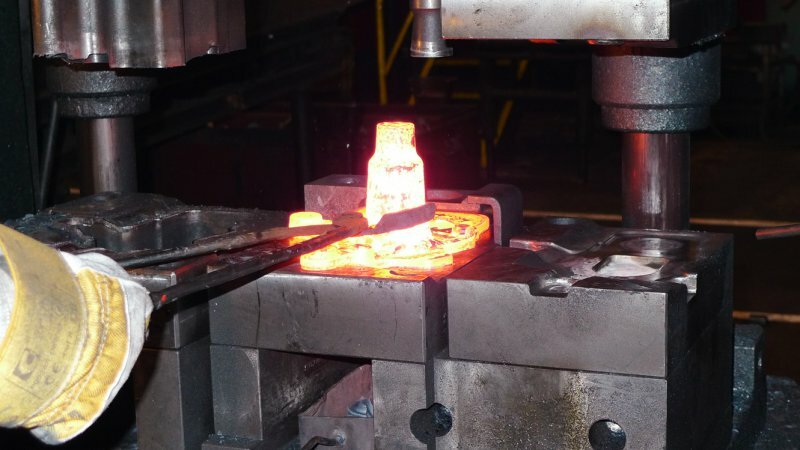 Consistency Between Forgings: Since the process of forging is controlled and deliberate, with each forging undergoing the same steps, it’s typically possible to ensure a consistent material over the course of many different forgings. This is in contrast to cast steel, which is more random in nature due to the processes used. Limit on Size: During the forging process, it’s more difficult to shape the metal, since forging occurs while the steel is still solid, unlike in casting where the metal has been reduced to its liquid form as part of the process. Since the metallurgist working with the steel will have more difficulty altering the metal’s shape, there’s a limit on the size and the thickness of the steel which can be successfully forged. The larger the metal section being worked on, the harder it is to forge. Closed die forging is one of the main process for manufacturing steel forgings. Closed Die Forging is a forging process in which dies move towards each other and covers the workpiece in whole or in part. The heated raw material, which is approximately the shape or size of the final forged part, is placed in the bottom die. The shape of the forging is incorporated in the top or bottom die as a negative image. Coming from above, the impact of the top die on the raw material forms it into the required forged form. High Strength: In making forged metal parts, the metal is worked twice under both tremendous pressures, first during rod extrusion/drawing or rolling and then during the close die forging process. The double working of metal under pressure compresses the metal and produces a very dense and refined grain structure. The tensile strength of the forged metal parts is thereby increased, and resistance to impact and abrasion is enhanced. Leak Resistance: The dense, non-porous aspect of forged metal parts permits the designer to specify thinner sections without the risk of leaks due to flaws and voids. Often the thinner forged metal parts result in lighter weight and lower piece cost compared to other manufacturing processes. Close Tolerances: Custom metal forgings produced in a steel die with close tolerances offers several advantages. Overall part dimensions are held closer than in sand casting. Dimensions show minimum variation from part to part and permit automatic chucking and handling in subsequent machining and assembly operations. The precise designs on the die surface can produce sharp impressions or depressions on the forging surface for company id or name, which is normally not the case with other forming processes. Low Overall Cost: Mass production of forged metal parts lends itself to maximum savings. However, smaller quantities of copper alloy forgings can also prove economical. As mentioned metal forgings have good leak integrity, close tolerances, high strength with low weight, and designs with a non-symmetrical shape. Steel forgings have superior surface condition compared to steel castings and therefore good for surface coating treatments like chrome or nickel plating, various painting options and anodizing. CFS Forge is one of the largest steel forging companies in China. We offer a variety of steel forgings, made by closed-die method, with low tooling costs and low prices. Normally, steel forgings are widely used for industries due to the greater strength of it's refined grain structure, as well as it's machinability, and it's low porosity, compared to steel castings. Our steel forgings are made by closed-die, or precision forging. Our lower tooling cost makes steel forging the best choice even at small quantities. We offer every imaginable secondary operations, including heat treatment, machining, surface coating, or otherwise fabricating. We provide all the value added services to make procuring steel forgings as easy and as cost-effective as possible. If you are interested in using metal parts made from steel forging, we can provide them for you! Here at CFS Forge., we know forgings. We have the ability to provide custom components that meet your specific requirements and can range in weight from a few ounces up to more than 50 pounds. Our quality metal components have helped us become a major supplier of steel forgings to a global customer base. Contact us for more information about our steel forging capabilities today!